Here you can see what happened when a star went supernova, and became the object known as SN 1987A. This artist's interpretation is based on data gathered from the European Southern Observatory's Very Large Telescope. 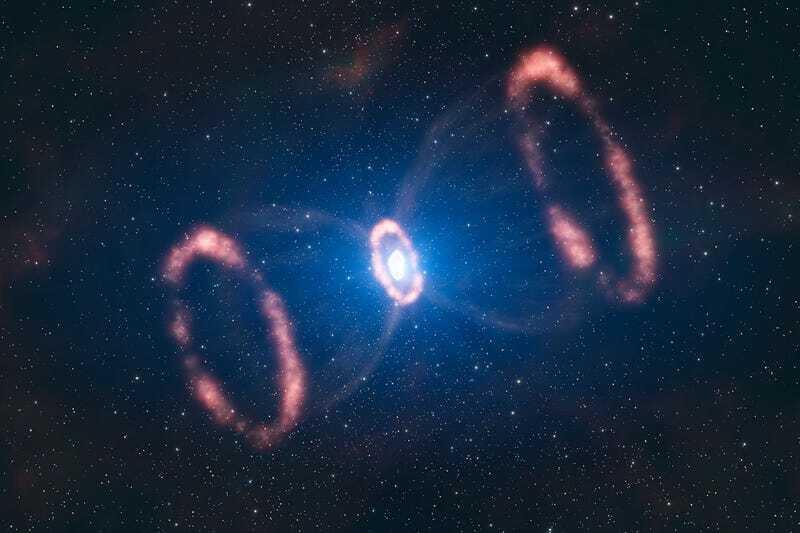 This artist's impression of the material around a recently exploded star, known as Supernova 1987A (or SN 1987A), is based on observations which have for the first time revealed a three dimensional view of the distribution of the expelled material ... The original blast was not only powerful, according to the new results. It was also more concentrated in one particular direction.This is a strong indication that the supernova must have been very turbulent, supporting the most recent computer models. This image shows the different elements present in SN 1987A: two outer rings, one inner ring and the deformed, innermost expelled material. Just how a supernova explodes is not very well understood, but the way the star exploded is imprinted on this inner material. The astronomers could deduce that this material was not ejected symmetrically in all directions, but rather seems to have had a preferred direction. This image was created by Luís Calçada, a Portuguese artist who works at the ESO in Germany. You can see more of his work on his website.